Devils Camp: A Goaltender Competition? When the New Jersey Devils officially opened training camp last week, the words “goaltending competition” were not readily anticipated but that very well could be one of the camp’s most important storylines. 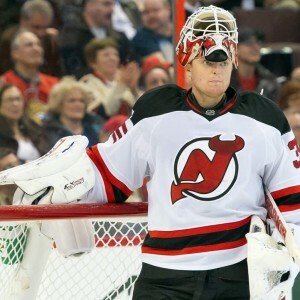 Goaltender Cory Schneider is the team’s solidified number one goalie as well as one of the league’s elite netminders. While his job is safe and not even up for debate, the backup goaltending position may be in question. Typically, when a roster position becomes vulnerable, it is a direct reflection of the athlete’s performance who is currently occupying the spot. However, this time, goalie Keith Kinkaid could just be a victim of circumstance. Kinkaid has been a solid number two goaltender for the Devils since he broke into the league two seasons ago. Like any goalie, he has encountered some rough patches but throughout the majority of the 43-games Kinkaid has played for the organization, he has risen to the occasion. When Schneider went down with an injury last March, not only did Kinkaid carry most of the load, he was also named one of the NHL’s Stars of the Week. Nevertheless, after dropping two games in which the team struggled, head coach John Hynes opted to give Kinkaid a break and turned to prospect goaltender Scott Wedgewood. Throughout his four-game appearance, Wedgewood recorded a .957 save percentage and only allowed two goals in three games. But the main highlight during his stint with the big club would wind up being a 39-save shutout victory against the offensively skilled Pittsburgh Penguins. Most would assume that having a group of strong goaltenders within an organization is not a bad thing and that would be correct. But after Wedgewood revealed last week that he would have to pass through waivers to rejoin the Albany Devils, New Jersey’s AHL affiliate, the notorious panic button made its first appearance of the season. Devils G Scott Wedgewood said he learned a couple of days ago he needs to clear waivers to be re-assigned to Albany (AHL). The training camp waiver wire almost always produces an unexpected player but most New Jersey fans did not anticipate seeing Wedgewood’s name on it. While the Devils could attempt to sneak him through the crowded preseason waiver wire, goalies are a commodity throughout the league. Wedgewood would undoubtedly draw the attention of several teams. While there is no guarantee that some franchise would claim him, if it did happen, it would mean the Devils seemingly gave away a promising prospect for free. Another fact that cannot be overlooked throughout camp is that Kinkaid is entering the final year of his contract with the Devils. While no one other than him can say with certainty, it is safe to assume that the 27-year-old does not want to remain a backup and would eventually like to challenge for a number one role. If that is indeed the case, Kinkaid will not find that opportunity with New Jersey. That is something that general manager Ray Shero must consider prior to putting Wedgewood on waivers. In a worse case scenario, the team could potentially lose two young goaltenders for nothing. The Devils are now facing a predicament but it may not have been unforeseen. It was widely thought that goaltender Anders Lindback was invited to New Jersey’s training camp on a professional tryout because of Schneider’s absence during the World Cup of Hockey. But Wedgewood’s revelation now adds another layer to the PTO invite, especially considering the fact that the Devils did not re-sign Wedgewood’s Albany backup, goalie Yann Danis. While New Jersey is not hurting in terms of goaltenders, the highly touted prospect Mackenzie Blackwood, as well as Ken Appleby, will likely not be vying for an NHL roster spot in the near future. Wedgewood has already told reporters that is he going to attempt to force the Devils to keep him, which would come at Kinkaid’s expense. Nevertheless, the concept that Kinkaid is entering the final year of his deal as well as has more NHL experience, makes him a more attractive trade candidate. All of those facts give Wedgewood a slight edge to remain with the club. But moving Kinkaid does provide some risk. Although it was a strong NHL debut, Wedgewood has a very small sampling size to judge from. Because of Wedgewood’s small sampling size, the Devils could put off making a commitment to either player and draw this competition out as long as possible. 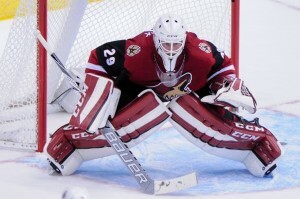 It is well-known that Schneider plays most nights and carries a heavy workload. If he did not miss time due to an injury last year, it is reasonable to believe that Schneider would have come close to his 2014-15 season total of 69-games. The Devils need to feel comfortable giving their star goalie the night off and it appeared that Hynes was gaining the necessary confidence in Kinkaid to do so. The backup goaltender can be an overlooked position, but it is one of the most important components of a team. Regardless of how this situation plays out throughout training camp, this will not be a small decision and could eventually have larger ramifications. The backup spot on any NHL roster has to be earned, and both young goalies will have a chance to do so. But if the Devils do elect to stay with Kinkaid, there could be a long 24-hours ahead for New Jersey fans.